The Clark School recognizes the importance of a diverse student body and is strongly committed to ethnic and gender diversity. We house and support several initiatives with a mission to recruit, retain, and graduate underrepresented minorities and female students in the engineering and science fields. The Center for Minorities in Science and Engineering (CMSE) and Women in Engineering (WIE) offer many programs, including mentoring, research internships, and summer programs, all of which are designed to aid in maintaining diversity goals. 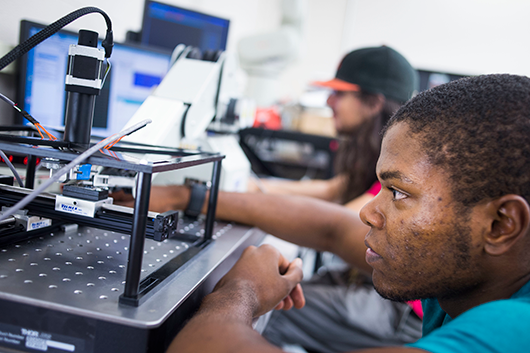 The Center for Minorities in Science and Engineering provides academic support services and outreach programs designed to recruit, retain, and graduate African American, Hispanic American, and Native American engineering students. The Women in Engineering program is dedicated to the recruitment and retention of women engineering students at the pre-college, undergraduate, and graduate levels. Supporting the efforts of CMSE and WIE, and providing valuable assistance to the Clark School, are three student societies—the Black Engineers Society, the Society of Hispanic Engineers, and the Society of Women Engineers. The Black Engineers Society (BES) is the student chapter of the National Society of Black Engineers at the University of Maryland. Their primary focus is to recruit, retain and release qualified minorities into fields of computer science, engineering, mathematics and physical sciences. The goal of the Society of Hispanic Professional Engineers (SHPE) is to assist students in all engineering and science fields with their academic and professional development. They also provide information on work opportunities and scholarships targeting Hispanics. The Society of Women Engineers (SWE) is a program within the Clark School of Engineering, run by faculty, graduate and undergraduate students. It is dedicated to the recruitment and retention of women engineering students at the pre-college, undergraduate, and graduate levels.